I couldn't resist, I cast on a new project. Now let me just say that I've finished a project so there was extra room in the knitting bag. Yesterday I posted about the baby blanket that is folded and waiting to be wrapped up. I saw this cowl pattern two weeks ago and knew I would have to cast on soon. Ravelry notes are here. I've been reading Persuasion by Jane Austen and it's been a little slow going for me. I'll blame my son who is still here visiting, okay? I'm into the story but when I read a classic, I find I cannot zip and skim read. I have to concentrate. I read before I go to sleep and as you well may know, my concentration is thin. However, I'm not starting any new novels until this one is done! You are tempting my Karen! :) I love the pattern and the pretty pink you are using. I am struggling with reading at the moment, but I do love a good classic. Love the colour of the yarn for the new project. That looks like an interesting pattern and your yarn is really lovely! How could you NOT cast on something new? You have finished a couple of projects so it's time to fill those needles back up! I have such a hard time reading at night these days. I don't get past the first page before my eyes close! Crazy day at the car service department yesterday so I missed the baby blanket reveal....off to get reinspired, I've started dragging just a bit on mine! (I've only been working on it 3 days....knitting ADHD I guess). Love the cowl color! That is a really gorgeous cowl! Just favorited it. Your blanket is beautiful. Off to go see that post more closely! such a pretty color...looks like the perfect summer knit! Enjoy your time with your son!! That is the prettiest pink! I love the pink! That's going to be a great cowl. Hopefully you find more time to focus on the book soon-I love Jane Austen so much, but it's no fun slogging through a slow read. Your projects are inspiring me. 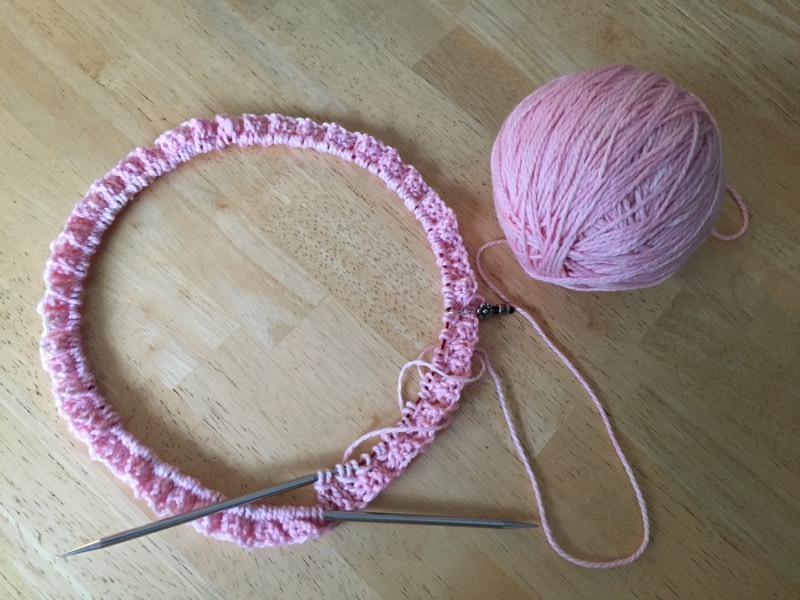 Now I am thinking of making a cowl with the cotton pink yarn. Haha. I will, most likely, knit the baby blanket however. I bog down with the classics too, but have certain times that I love them. Persuasion is fabulous - my favourite Austen. I agree though, I tend to read before bed and fall asleep after a little bit. So I need light reading for then. And my concentrating reading time is limited. I love the pink yarn. It will make a lovely cowl. That cowl pattern looks nice! I know the feeling of finally finishing a project and then wanting to cast on a new one! Love that cowl pattern! Beautiful yarn! Wonderful read! I very much like your new cowl pattern and yes classics do need focus - such beautiful use of words to enjoy. Yes, I always feel like Jane Austen's novels are "chewy" - they take a little effort to get through. I know every line of Emma by heart and still I have to concentrate. Congrats on your lovely finish from yesterday! what a lovely pink colour! I just finished a baby dress today and will probably cast on a toy bunny to go with it tonight. I finished All The Light We Cannot See a few days ago and I really liked it. Today I picked up a book at the pool which looks like a good summer read outside. Yay pink! And yay new project! What a gorgeous colour and the perfect cowl to knit it into. What a beautiful shade of pink Karen. Enjoy your book. Your blanket is so lovely. And, I love the color of this yarn for the cowl. I love that yarn color. I checked it out, that pattern is great. I am looking forward to watching your cowl grow. Persuasion is one of my all-time favorites. I just love that story. SO romantic and heartwarming and beautiful :) And I can't blame you for casting on a new project....I feel the temptation every day! Does it need to be justified? Have a lovely weekend coming up!! I'm already a slow reader usually, but when it comes to classic I take even more time. I just finished a book yesterday and not sure yet with what book I'll continue now. I'm knitting a pair of fingerless mitts. Did you figure out the pattern? It looks like you have to buy the yarn in order to get it?